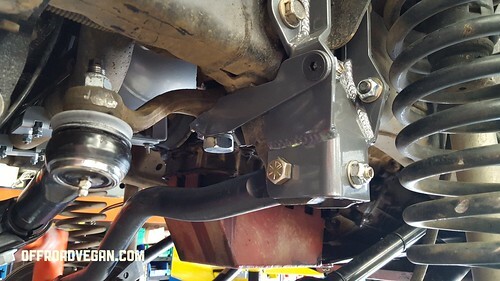 Today with friends Chad and Dirk, we installed a Synergy Tie Rod and Sector Shaft brace kit into Chad’s 2007 Jeep JK. 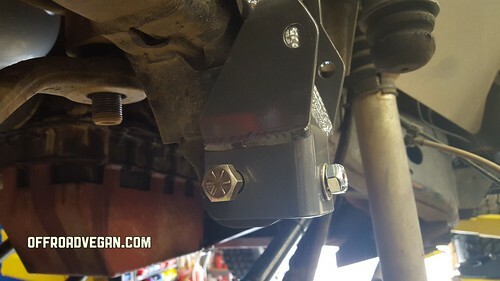 This was a great project, so I decided to do an install on it, hopefully to help any other Jeepers with their own future installs. 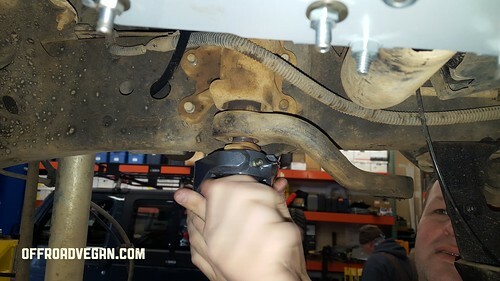 Remove factory components: We ended up removing the track bar, sway bar links, driver’s side coil, and drag link. 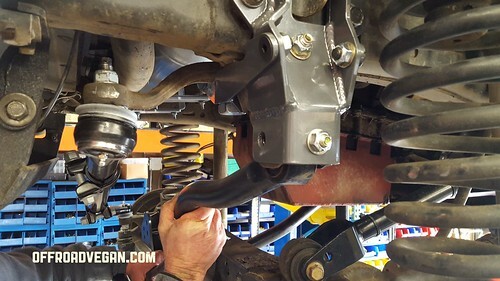 We also removed the driver’s side shock, to help with coil removal. 2. 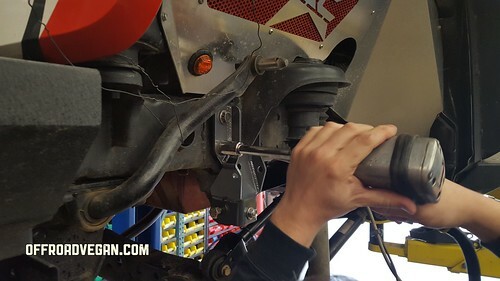 Remove the four factory bolts that hold the steering box in place. 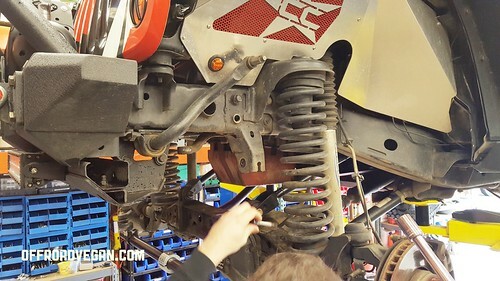 Be sure to leave one barely threaded, or have a friend ready to catch and hold the steering box! These are the only bolts holding it in place. 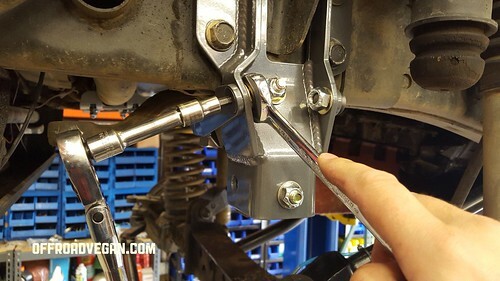 Remove the pitman arm nut (keep the washer handy!). 3. 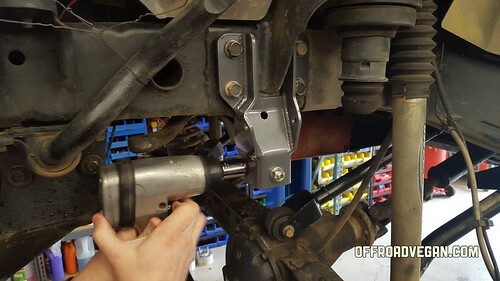 Slide the Synergy track bar bracket into place and thread the same 4 bolts back into place. Leave them hand tight. 4. 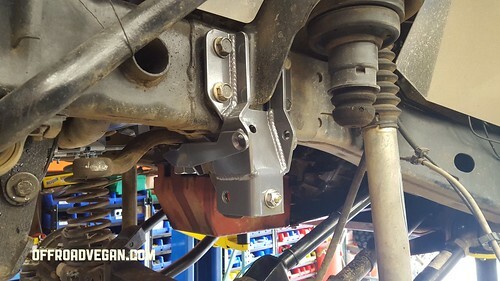 Insert the 1″ bolt through the frame track bar bracket and the new Synergy bracket. Attach the stover nut and washer per the below image. Do not tighten. 5. 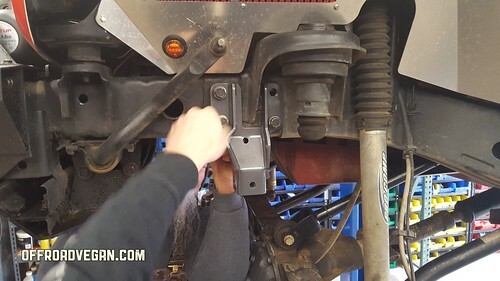 Prepare to insert the 3.25″ bolt that will hold the track bar into the bracket. Using a punch or other aligning tool, line up the holes and insert the bolt. We had to thread it in, it’s a pretty tight fit. Apply the nut, but do not over tighten. 6. 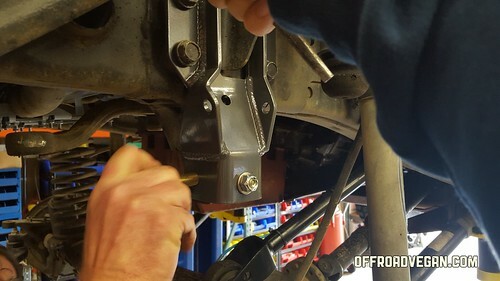 Now that the alignment points are tight, use an impact to tighten the original four bolts into the steering box. 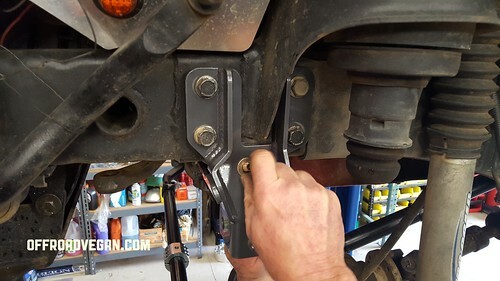 You will remove the two lower bolt combinations in the next steps. But keep the 4 for the steering box in place. 7. 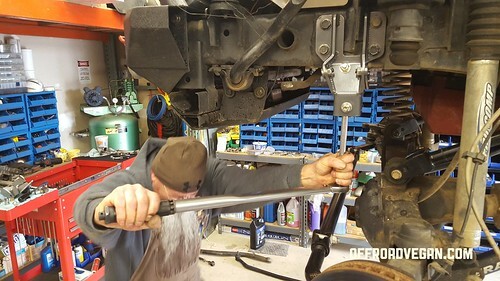 Remove the track bar bolt. 8. 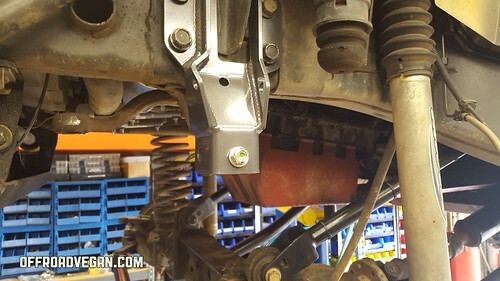 Insert the sector shaft bracket over the sector shaft and the new track bar bracket. OEM washer and the new pitman arm stud through the bracket into the sector shaft. 9. 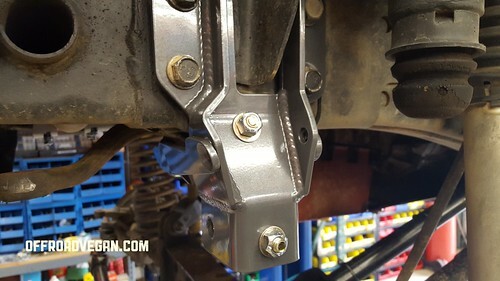 Insert the small bolt/nut/washer combo that combines the sector shaft brace bracket with the new track bar bracket. 10. Add the two 7/16-14 x 1.0” bolts up through the remaining slots and hand tighten. Dirk “reefing” on the pitman stud. 12. 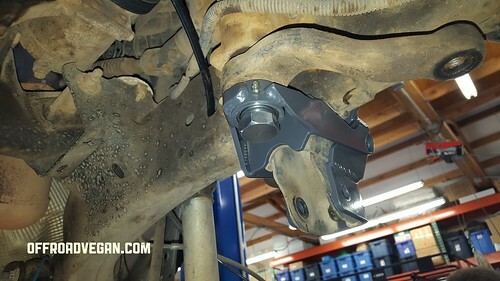 Install the drag link. 13. Install the track bar. 14. 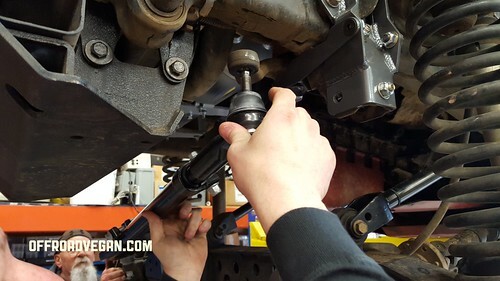 Perform a final bolt check, grease the zerk, lower vehicle and inspect steering, making any adjustments as needed.